This photograph shows a typical hospital workshop between 1916 and 1918. 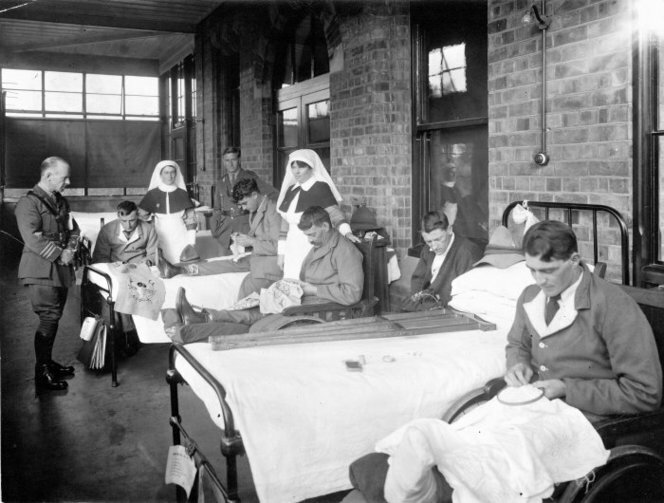 Beaufort War Hospital became an Orthopaedic Centre in the summer of 1916. Orthopaedics was a relatively new medical discipline. Up until the 1890s, orthopaedics was a study limited to the correction of deformity in children. Beaufort was selected because of its existing workshops and other buildings that could easily be adapted to accommodate basket-making, rug-making, slipper-making, carpentry and joinery, engineer’s and smith’s work, splint-making and finishing, embroidery, tailoring, upholstering, boot-repairing, typewriting and gardening. These activities were instituted primarily as a curative measure, but also as a way of acquiring proficiency in such occupations. The essential feature of the curative workshop was that it supplied a natural instead of an artificial means of restoring the injured limb to function. The mere act of doing useful work reacted too upon the man’s mind and re-awakened hope in one who otherwise, after long months of hospital treatment, was liable to become derelict. The Bristol centre opened in the summer of 1916. In March 1917, King Manuel II of Portugal – representing the joint committees of the British Red Cross Society and the Order of St John of Jerusalem – visited with a number of important dignitaries. A large assortment of the high quality work done by the patients was exhibited, including basket-making, metalwork, carpentry, painting, upholstering, tailoring, leatherwork and needlework. They also visited the wards, the electrical and massage departments, and watched a class of twenty men being exercised in Swedish drill. Special athletic sports for wounded men were held in the grounds, and King Manuel afterwards presented the prizes to the winners of these events. Throughout the afternoon a band, composed of orthopaedic patients, played a selection of music. Colonel Robert Jones, CB, was appointed Inspector of Military Orthopaedics in 1916 and was responsible for promoting the benefits of orthopaedics, leading to centres being opened across the country, including Bristol. He recommended a Bristol surgeon Captain Ernest William Hey Groves, MD, MS, FRCS, with a special interest in orthopaedics, to open Bristol’s military orthopaedic centre at Beaufort War Hospital. At the opening in March 1917, Colonel Jones explained that orthopaedics was the treatment of injured limbs and the restoration to use and function of arms and legs which had been deprived of these by various gunshot wounds involving the nerves, bones and joints. It is thought that at least 50% of all serious military injuries were of an orthopaedic nature, and of these servicemen the greater number could be restored to the Army or to civil employment by proper treatment. By October 1917 some 25 officers’ beds and 382 beds for other ranks had been set aside at the Beaufort War Hospital. Although the scheme was experimental, men from distant parts of the world came to study the methods: New Zealand, British Columbia, and a constant stream of American surgeons. As the number of soldiers needing treatment grew rapidly and the authorities always tried to send men requiring it to establishments as near their own homes as possible, it became imperative to have more beds. The transfer from the Beaufort War Hospital to Southmead Hospital was completed in June 1918.